To Cite: Mohsenipoua H, Majlessi F, Shojaeizadeh D, Rahimiforooshani A, Ghafari R, et al. Predictors of Health-Promoting Behaviors in Coronary Artery Bypass Surgery Patients: An Application of Pender’s Health Promotion Model, Iran Red Crescent Med J. 2016 ; 18(9):e59187. doi: 10.5812/ircmj.38871. Background: Advances in coronary artery surgery have reduced patient morbidity and mortality. Nevertheless, patients still have to face physical, psychological, and social problems after discharge from hospital. Objectives: The objective of this study was to determine the efficacy of Pender’s health promotion model in predicting cardiac surgery patients’ lifestyles in Iran. Methods: This cross-sectional study comprised 220 patients who had undergone coronary artery bypass graft (CABG) surgery in Mazandaran province (Iran) in 2015. The subjects were selected using a simple random sampling method. The data were collected via (1) the health-promoting lifestyle profile II (HPLP II) and (2) a self-designed questionnaire that included two main sections: demographic characteristics and questions based on the health-promoting model constructs. Results: Spiritual growth (28.77 ± 5.03) and physical activity (15.79 ± 5.08) had the highest and lowest scores in the HPLP II dimensions, respectively. All the health promotion model variables were significant predictors of health-promoting behaviors and explained 69% of the variance in health-promoting behaviors. Three significant predictors were estimated using regression coefficients: behavioral feelings (β = 0.390, P < 0.001), perceived benefits (β = 0.209, P < 0.001), and commitment to a plan of action (β = 0.347, P < 0.001). Conclusions: According to the results of the study, health-promoting model-based self-care behaviors can help identify and predict cardiac surgery patients’ lifestyles in Iran. This pattern can be used as a framework for discharge planning and the implementation of educational interventions to improve the lifestyles of CABG patients. According to a world health organization (WHO) report in 2011, cardiovascular disease causes 45% of deaths among Iranian people (1). Coronary artery bypass graft surgery (CABG), as the most comprehensive treatment of coronary heart disease, has stood the test of time, having been in use for nearly 50 years (2). In the United States, 400,000 such surgeries are performed annually (3). CABG is carried out on 60% of patients suffering from coronary artery ischemic diseases (CHD) (4). Due to the inherent progression of CHD and the development of vein graft atherosclerosis, patients treated with CABG are at risk of subsequent ischemic events during the months and years following the procedure (2). Even though CABG has improved in terms of its success rate, patients still have to deal with a number of physical, psychological, and social problems in the period following discharge from hospital (5). The side effects reported by patients after CABG include a variety of problems such as postoperative pain, insomnia, changes in appetite or taste, chest pain, respiratory difficulties, arrhythmia, palpitations, numbness of the arms, abdominal distention, weight loss, anxiety related to the treatment and their ability to adhere to the recommended physical activity schedule, weakness, headache, vertigo, depression, nausea, and vomiting (6). Patients undergoing cardiac surgery must be well-informed of the potential problems, activity enhancements, nutrition, and medication beforehand since the success of the surgery is highly dependent on the patients’ understanding of the disease and the required activities, including the diet and medical regimen, required after surgery (7). The American heart association has divided the risk factors of coronary artery disease into two categories, namely modifiable and non-modifiable risk factors. The non-modifiable risk factors, such as age, gender, family history, and genetic factors, cannot be modified or controlled, while smoking, hyperlipidemia, hypertension, lack of physical activity, obesity, and diabetes mellitus, which can be controlled, comprise the modifiable risk factors (8). Self care is the process by which a person takes care of him/herself through a number of health-providing activities, the basic principle of which is for the person to contribute to the process and to take responsibility for him/herself (9). In the cardiovascular literature, self care refers to symptom response, the adherence to treatment recommendations, and the adoption of healthy lifestyle behaviors, like smoking cessation and weight management (10). This process can take place in several ways and be delivered by either peer leaders or health providers, such as on a one-to-one basis between the patient and healthcare provider or via disease-specific group education programs, in clinical locations or at the patient’s home (11). Research on self-care behaviors among patients with cardiovascular diseases indicates poor self care in these patients, which therefore necessitates and emphasizes the need for further training in this regard (6, 9, 12). Many patients do not really believe in the positive effects of self-care behaviors on symptomatic relief and lifestyle improvement. This can influence their adherence to self-care behaviors and consequently lead to the patients’ lack of motivation to display such behaviors (13). The existing problems with regard to the creation, maintenance, and improvement of self-care and health-promoting behaviors, as well as the complex nature of these behaviors, require that behavior change theories or models be used in this field. This is because theories identify the factors influencing the concerned behavior, specify the relationships between these factors, and present the conditions, methods, and timings of these relationships (14). One of the most comprehensive and predictive models used to help study health-promoting and self-care behaviors and create a theoretical framework to discover the factors influencing such behaviors is Pender’s health promotion model (HPM). The model includes three basic components that influence health-promoting behaviors: (i) individual characteristics and experiences (prior related behaviors and personal factors); (ii) behavior-specific cognitions and affect (perceived benefits of action, perceived barriers of action, perceived self-efficacy, situational influences ,interpersonal influences, and activity-related affect); and (iii) desirable health-promoting behaviors (adherence to specific plans of action) (15). Although this model has been applied in various studies and its predictive power has been proved (15-19), to the best of our knowledge no studies have been conducted thus far on the model’s ability to predict health-promoting behaviors and the lifestyles of heart surgery patients. According to the WHO, lifestyle is the primary contributor to the burden of death in both developed (70% - 80%) and developing (50% - 60%) countries (20). Given that a lack of patient knowledge of self care may lead to higher healthcare system costs in Iran, one might conclude that healthy living and self-care behaviors are important issues that need to be addressed among cardiac surgery patients. The question raised in this research was therefore whether HPM-based self-care behaviors can play an active role in identifying and predicting the lifestyles of heart surgery patients. In the present study, the researchers conducted a survey to determine the efficacy of Pender’s HPM in predicting cardiac surgery patients’ lifestyles in Iran. This cross-sectional study was conducted at the educational and treatment heart center hospital of the University of Medical Sciences and the medical specialized center in Sari, Iran, from March to September 2015. The educational and treatment heart center hospital is a governmental, specialized, and referral hospital with 220 beds and 20 wards located in northern Iran. It offers treatment by the most professional physicians in this field and region. Additionally, the Tooba Medical Center is the first specialized center in the region. The city of Sari is the capital of Mazandaran Province and one of the main tourist destinations in Iran. The inclusion criteria included being conscious, being willing to participate in the study, having had the surgery at least one month prior to participation in the study, not being in an emergency condition, and not suffering from any speech or hearing problems. Considering that Z = 1.96, P = 30%, and d = 0.061, 220 patients were considered for this study (Equation 2). Hence, a list of 325 patients with at least a one-month lapse since their surgery was provided. Subsequently, 220 patients were randomly selected from among them. The data were collected by means of (1) the health-promoting lifestyle profile II (HPLP II) questionnaire and (2) a self-designed questionnaire comprising two main sections: demographic characteristics (11 items), which included age, gender, marital status, educational level, lodging, and economic and employment status; body mass index (BMI); ejection fraction (EF); and questions based on the HPM constructs (97 items). The HPLP II is a reliable and validated questionnaire specifically about health-promoting lifestyles and was designed in accordance with Pender’s model. The instrument consists of 52 items in six domains: nutrition (9 items) is what a person eats; physical activity (8 items) is concerned with the amount of exercise necessary for a healthy life; spiritual growth (9 items) is a person’s positive attitude toward him/herself, the ability to improve his/her capabilities, and creativeness in reaching his/her objectives; health responsibility (9 items) is a person’s sensitivity about his/her health; stress management (8 items) is the ability to identify the stresses a person has and how to overcome the stress-generating factors; and interpersonal relationships (9 items) is concerned with the ability to interact and maintain relationships with others. Each item is presented in four incremental levels, namely (1) never, (2) sometimes, (3) often, and (4) always (21). - Prior related behavior: the evaluation of qualitative and quantitative scales of self care in the past (40 items in 9 sections: nutrition and diet therapy, wound care, physical activity, daily activities, sleep and rest, the removal of harmful habits, medication orders, sexual activity, and going to the doctor). Each item was presented in five incremental levels. The content validity of the instrument was CVI = 0.90 and CVR = 0.84, with the Cronbach’s alpha coefficient being 0.77 for the total scale and 0.72 to 0.82 for the subscales. The ratings were summed for a possible range of scores from 97 to 485. Amos 22 (manufacturer’s name, city, country or state if in the US) was used to assess the model fit of the obtained data. The Kaiser index of sampling adequacy obtained during factor analysis was 0.76. Moreover, the chi-squared value for Bartlett’s test was P < 0.001. The goodness of fit indexes (GFIs) and the direct and indirect effects of each of the instruments are presented in Tables 1 and 2, respectively. The chi-squared index (χ2), the root mean square error of approximation (RMSEA) index, the GFI, the adjusted GFI, the normalized fitness index (NFI), and lastly, the comparative fit index (CFI) were found to be 0.003 (P = 0.957), 0.001, 0.98, 0.93, 0.97, and 0.99, respectively. Abbreviations: AGFI, adjusted goodness of fit index; CFI, comparative fit indices; GFI; goodness of fit index; NFI, normal fit index; RMSA, root mean square error of approximation. The data were collected by visiting the patients in their homes. Before visiting them, they were contacted telephonically and the research objectives explained to them along with the required explanations regarding the purpose of the contact. Their consent to participate in the study was also obtained. Thus, with the individuals’ permission, their addresses were requested, and the submission date of the completed questionnaire was specified. The questionnaires were handed to the patients and their written informed consent obtained when visiting them in their homes. In cases when the patients were unable to respond to the questionnaire on their own, the researcher would read out the questions to them and the patients would select the appropriate answers verbally. SPSS software version 22 (manufacturer’s name, city, country or state if in the US) was used to analyze the data. In all the analyses, the normalizing of the data distribution was evaluated using the skewness and kurtosis test. Descriptive statistics, including frequency, percentage, and mean and standard deviation, were used to describe the demographic characteristics and health-promoting behaviors of the patients. The independent variables (HPM characteristics) were entered in a multiple linear regression to predict the effect of each dependent variable (lifestyle characteristics). P < 0.05 indicated statistical significance. The ethics committee at Tehran University of Medical Sciences provided ethics approval for the study, which is part of a PhD thesis in the field of health education and promotion at the international campus, Tehran University of Medical Sciences, with the code IRCT2015001248742N6 (grant ID: 28217). A brief explanation of the study was given to the patients who met the inclusion criteria, and informed consent was obtained from all the participants. Table 3 indicates the demographic characteristics of the participants. Of a total of 220 participants, 143 (65%) were male. Half of the participants were in the age group 54 - 66 years. Eighty-four participants (38.2%) had only passed elementary school, and 203 (92.3%) of them were married. In total, 183 (83.2%) of the patients had EF > 40%. More than half of them were overweight (BMI: 25 - 29.9). aAccording to the world health organization, body mass index (BMI) can be divided into four categories: low weight (less than 18.5), normal (18.5 - 24.99), overweight (25 - 29.99), and obese (30 and above). Table 4 shows the mean and SD of the HPBs among the cardiac surgery patients. The mean score of the HPLP of the patients was 146.79 ± 21.97. While the spiritual growth dimension had the highest score (28.77 ± 5.03), physical activity received the lowest score (15.79 ± 5.08). Abbreviations: HPLP II, health-promoting lifestyle profile II; SD, standard deviation. The results of the multiple regression analysis (Table 5) showed that all the HPM variables were predictors, thus explaining 46% of the variance in health responsibility. Two significant predictors, namely perceived benefits and commitment to a plan of action, were estimated to have regression coefficients of 0.318 (P < 0.001) and 0.265 (P < 0.001), respectively. A regression analysis was carried out to study the effects of the HPM variables on physical activity. All the HPM variables were predictors that could explain 48% of the variance in physical activity. The three most significant predictors of physical activity were behavioral feelings (β = 0.298, P < 0.001), perceived benefits (β = 0.153, P = 0.035), and commitment to a plan of action (β = 0.231, P < 0.001). The findings of the study revealed that all the HPM variables were predictors that explained 55% of the variance in nutrition. Four significant predictors were identified: behavioral feelings (β = 0.171, P = 0.007), perceived benefits (β = 0.158, P = 0.022), perceived barriers (β = -0.132, P = 0.035), and commitment to a plan of action (β = 0.314, P < 0.001). In this study, all the HPM variables were predictors that explained 66% of the variance in spiritual growth. Behavioral feelings was estimated to have a regression coefficient of 0.480 (P < 0.001), while perceived barriers and commitment to a plan of action had regression coefficients of 0.135 (P = 0.017) and 0.330 (P < 0.001), respectively. All the HPM variables were predictors that could explain 57% of the variance in interpersonal relationships. Behavioral feelings (β = 0.307, P < 0.001), perceived benefits (β = 0.186, P = 0.007), and commitment to a plan of action (β = 0.207, P < 0.001) were the most positive predictors of interpersonal relationships. Moreover, with respect to the effects of the HPM variables on stress management, all the HPM variables were predictors that could explain 56% of the variance in stress management. Behavioral feelings was estimated to have a regression coefficient of 0.383 (P < 0.001), while commitment to a plan of action had a regression coefficient of 0.225 (P < 0.001). Finally, all the HPM variables were predictors that could explain 69% of the variance in overall health-promoting lifestyle patterns. Behavioral feeling (β = 0.390, P < 0.001), perceived benefits (β = 0.209, P < 0.001), and commitment to a plan of action (β = 0.347, P < 0.001) were the most likely predictors of overall health-promoting lifestyle patterns (Figure 1). The aim of the current study was to determine the efficacy of Pender’s HPM in predicting cardiac surgery patients’ lifestyles in Iran. In this study, the spiritual growth dimension had the highest mean score among the participants, which was in accordance with the findings of previous studies (22-26). Stability in life, a close relationship with God and society, and individuals having a good relationship with themselves determine spirituality. The participants’ lowest score was for physical activity, which was also similar to the results of other studies (22-24, 26-28). In this study, 55% of the patients were overweight with a BMI of 25 - 29.9, which could have been the result of a lack of physical activity and the presence of chronic diseases. Many studies have shown that there is a strong inverse relationship between physical activity and the risk of developing cardiovascular diseases in healthy adults. Current clinical practice guidelines recommend that patients with manifest cardiovascular disease do some exercise every day as a secondary prevention measure. For instance, according to a US guideline, patients should do 30 - 60 minutes of moderate-intensity aerobic activity, like brisk walking, at least 5 days a week, but preferably every day (29). According to our findings, all HPM variables were predictors that could explain 55% of the variance in nutrition. Nutritional behaviors can be determined by behavioral feelings, perceived benefits, perceived barriers, and a commitment to a plan of action. Mohebi et al. (2013) found the same result in their study (30). Diet is a complicated behavior that does not change easily. Previous reports have suggested that the majority of patients do not comply with dietary prescriptions (31, 32). Regression analysis indicated that all the HPM variables were predictors that could explain 48% of the variance in physical activity. The most positive predictors of physical activity were behavioral feelings, perceived benefits, and commitment to a plan of action. Wu and Pender (2002) reported that all the variables in their study accounted for 30% of the variance in physical activity (33). The most important predictor of physical activity was perceived self-efficacy. Nevertheless, Vahedian-Shahroodi et al. (2013) concluded that, among employees, prior related behavior (β = 0.45, P < 0.000) and self-efficacy (β = 0.17, P < 0.001) were the most positive predictors of physical activity, with the structures of the patterns predicting 34.6% of the variance in physical activity behavior (34). In this study, all the HPM variables were predictors that could explain 69% of the variance in the patients’ overall health-promoting behaviors. This finding was partly in line with that of Bahmanpour (2011) in which all the HPM variables were statistically significant predictors of oral health behavior, explaining 42.2% of the variance (35). The results of Shin’s (2008) study indicated that prior health-related behavior, biological, psychological, and sociocultural factors, behavior-specific cognition and impacts, environmental influences, and commitment to a plan of action were the variables that justified 73% of the variance in health-promoting behaviors (36). Notwithstanding, sample size and the target population could have caused these differences. Chiou’s (2016) study revealed that no smoking, the absence of obesity, perceived risk factors, self-efficacy, perceived control of health, and family support predicted 40.6% of the variance in health-promoting behaviors (37). This result could have been a reflection of the role of nutrition, physical activity, and interpersonal communication in disease control among the study’s patients. 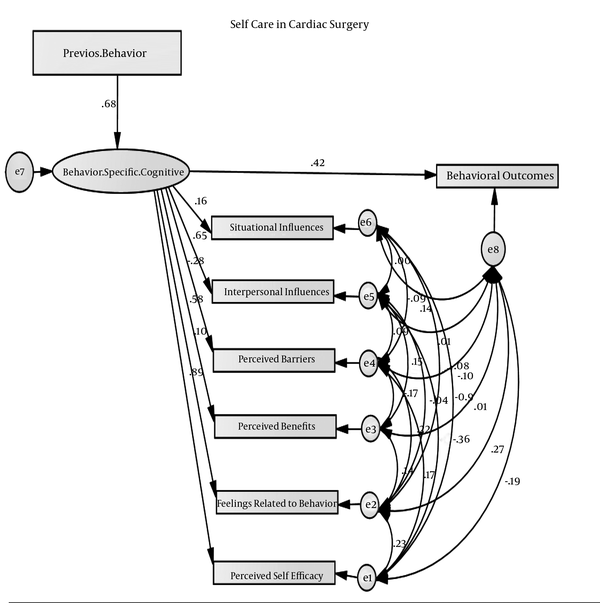 According to the results of this study, HPM-based self-care behaviors can help identify and predict the lifestyles of cardiac surgery patients in Iran. This pattern can be used as a framework for discharge planning and the implementation of educational interventions to improve the lifestyles of cardiac surgery patients. The results of our study showed that behavioral feelings, perceived benefits, and a commitment to a plan of action play a more prominent role compared to other factors in cardiac surgery patients’ lifestyles. Therefore, it can be concluded that patients’ emotions and motivations should be positively reinforced. Behavioral feelings are the subjective feelings that occur before, during, and after an activity related to the behavioral event. Behavior-related effects elicit an emotional response that is either negative or positive. Each effect is stored in the memory and recovered when considering whether to participate in the given behavior again. Behavioral feelings also influence health through self-efficacy and commitment to a plan of action. Accordingly, if patients have a positive feeling about their self-care behaviors, their self-efficacy will increase, which will lead to further positive impacts. We also believe that patients should be given a clear explanation of the benefits of positive behaviors. Perceived benefits motivate patients to develop a plan and commit to a particular behavior in order to achieve their expected goals. The provision and testing of a suitable model for self-care behaviors in heart surgery patients was among the strengths of this study. The research results could also pave the way for training interventions in future studies. Nevertheless, the lack of a control group to compare the lifestyles of patients in both experimental and control groups can be considered a weakness of this study. This study had some limitations. The data were collected through self-report questionnaires, which may possibly have tempted the participants to present more desirable images of themselves. Moreover, the participants may have tended to over- or underestimate their health-promotion activities. We would like to thank the patients and their families at the Tooba medical center, heart center hospital of the Mazandaran University of Medical Sciences, Sari, Iran, for their participation in this study. Authors’ Contribution: Study concept and design: Hossein Mohsenipoua, Fereshteh Majlessi, and Davood Shojaeizadeh; analysis and interpretation of the data: Hossein Mohsenipoua, Fereshteh Majlessi, Davood Shojaeizadeh, and Abbas Rahimiforooshani; drafting of the manuscript: Hossein Mohsenipoua, Fereshteh Majlessi, and Davood Shojaeizadeh; conduction, data collection, and participation in the writing of the article: Rahman Ghafari and Valiollah Habibi. Funding/Support: This study, as a research project (number 28217, dated 2015) was financially supported by the international campus, Tehran University of Medical Sciences.